Bring the world home to your baby with Baby Einstein! WHen you join Baby Einstein Playful Discoveries today, you’ll start sharing the gift of reading. Each month, you’ll receive a new selection of age-appropriate books to read with your child. 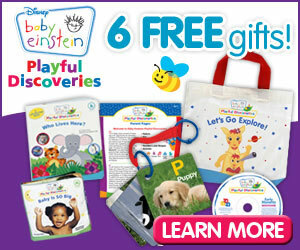 With Baby Einstein, you’ll…. * make an affordable, convenient investment in your baby’s future. As a special bonus, you’ll get 3 free books along with 4 FREE gifts. Pay only shipping. Restrictions applied.